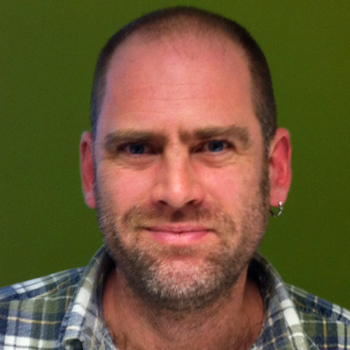 Mark has worked in construction for about 25 years as a carpenter (joiner), in building control and also environmental health. Concerned about how buildings were being built, the amount of waste, the embodied energy of the materials in use, etc., he began to explore other options. 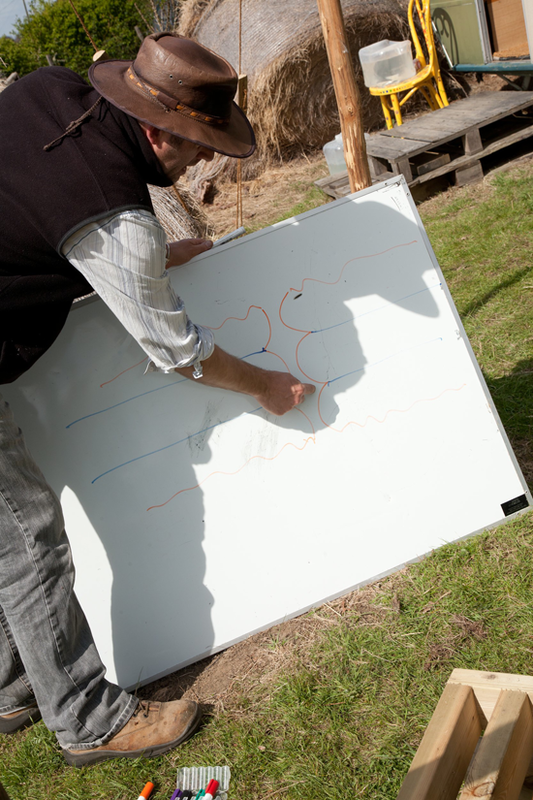 Since 2000, he has been straw bale building and running training courses in the South East of England. Straw bale building was used extensively in Nebraska, US, in the late 1800s and early 1900s. Early settlers had to make use of the materials they had to hand. Although the bales used for construction are essentially regular bales (that you would see in a farmer’s field), they must be of good quality. This means the bales must be nice and tight, reasonably even-sized, dry, vermin-free and seed-free, etc. To a degree, choosing the right bales is a common sense undertaking. If a bale is damp it will smell damp and it will probably look darker and might even be blackening. These damp bales will also be heavier than a usual bale. Obviously experience of a dry bale is important to be able to tell this. 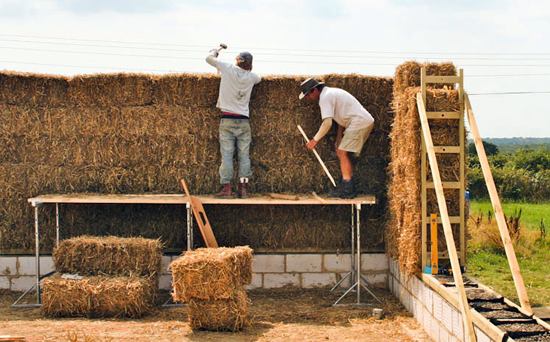 Asking sensible questions of the farmer will also be helpful but it may still be a good idea to engage the services of someone who is experienced in straw bale construction. Mark explains that for a load-bearing structure (essentially when you build out of bales just as you would if you were building with bricks) there may be an opportunity to lay a low impact foundation with less concrete, but this will depend on the ground conditions and the size and design of the building. Although Mark has seen examples of black mould and mushrooms growing on unfinished buildings, he says that it comes down to inappropriate detailing and weather protection during the build. 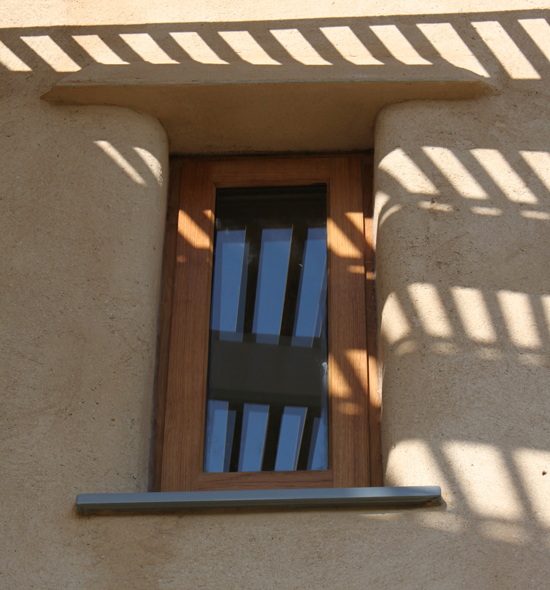 A lot of the principles that need addressing during a straw bale build are the same as a when constructing with brick and block, timber, rammed earth, etc. Get it off the ground and stop rising damp coming up into the building (with the damp proof course, etc.). As with any building, dealing with moisture is very important. 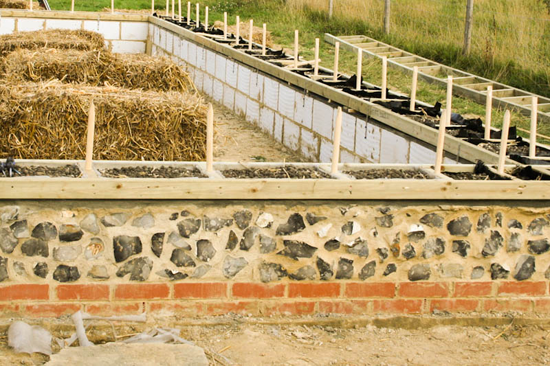 Essentially in a straw bale building the damp proof course is protecting the timber ladder as much as anything. The other source of (external) moisture is rain, which is kept out by having either impermeable or semi-impermeable materials. While in a brick house this would be the bricks and mortar, in a straw bale house it might be timber cladding or lime render. Internally, a good ventilation strategy will be necessary to deal with moisture that builds up in the air from cooking food or drying clothes, etc. Using breathable materials – that have the ability to absorb and release moisture without it adversely affecting the longevity of the given material – can also assist in this process. 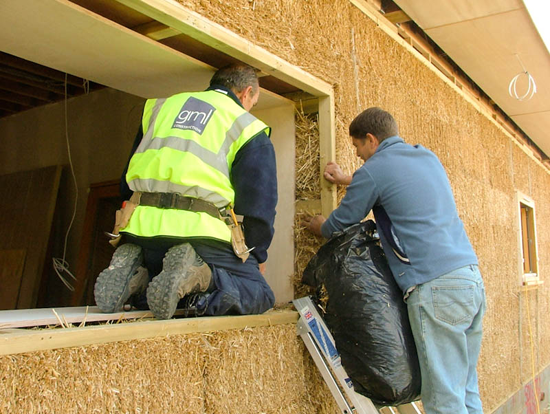 Some examples of breathable materials include timber, sheep’s wool, wood fibre, lime plaster and straw bales. Although the type of straw, its density and the quality of the build are all factors that affect the rate of heat loss, on average straw bales have a U value of 0.15 w/m2. Put into context, UK building regulations currently only demand 0.28 w/m2 (so a straw bale wall has roughly half the heat loss of a building regs compliant wall). Mark talks about the ModCell system called Balehaus, which claims a U Value as low as 0.13 w/m2 is possible for their 480mm straw product. 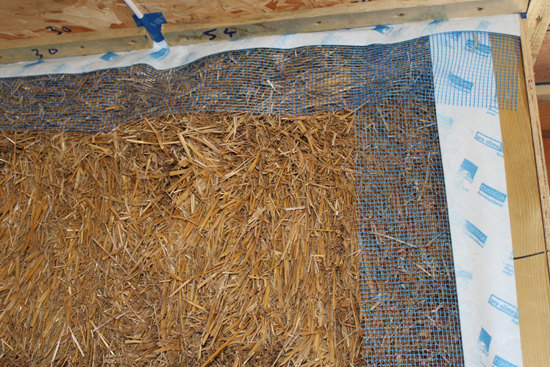 Typically with a rendered, plastered and clad (straw bale) wall, the thickness will be about half a metre. However, with building regulations likely to become more stringent in the coming years and most ultra low energy buildings demanding a lot of insulation anyway, this space is not out of the ordinary. Unless in a densely populated area, sacrificing an extra 10cm or so (in thickness) to use a low embodied material is not normally a big issue. Mark talks about non-load bearing structures – essentially where there's a framed building with straw bales in between – and how with an engineered frame (that's been tested accordingly) and infill panels, there is no limit to the number of floors of a building. With a load bearing structure, on the whole they are only single or double storey buildings. Mark says there are some examples with three storeys but it's more like a half storey with a low eave (a chalet bungalow), that reduces some of the risk and some of the heights of the straw. This also makes better use of the materials because you are occupying half a roof space. Although Mark had no information on whether straw bale houses can be valued alongside brick and block houses, he suggested that most people are fulfilling a dream to live this way and might stay in their new homes for many years. However, if a house is structurally sound and the building has been approved, inspected and signed off by building control, then getting a mortgage shouldn’t be a problem. Some mortgage companies will insist on a building warranty (which can be obtained from warranty companies). In the UK, Triodos and the Ecology Building Society both lend money at a preferential rate if you build to a good eco standard. Trying to make a house ‘eco' as an afterthought, by transposing materials for example, will probably mean that a straw bale build becomes more expensive. Designing the building from scratch with good environmental considerations can help bring the price down, particularly if you're making your own clay plaster or if you use reclaimed materials, etc. As the walls only account for about 15% of the final cost of building a house, the savings of a straw bale construction may not be as great as one might hope. So, comparing like-for-like brick and block house to a straw bale house, even if the straw bales were half the price, it's not a massive reduction in the cost of the build. Mark points out that designing a house to the size of your needs rather than to that of your greed will really reduce costs. Also, having a good thermal performance in the floor and the roof, and high performance windows that benefit from solar gain. Plus, installing high efficiency heating, lighting and hot water systems will all contribute to lowering the running costs. 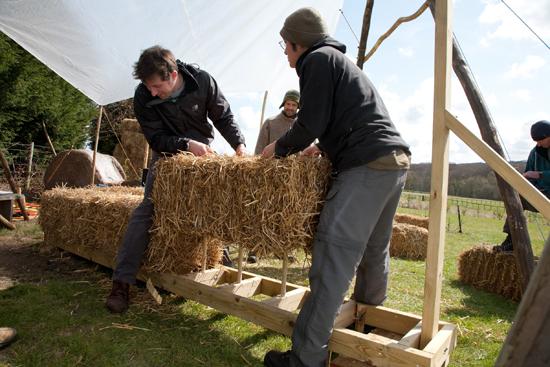 Mark sums up building with straw bales as friendly and fun, and it ticks all the environmental boxes! He does recommend that it should be guided DIY, whereby you engage the services of someone who understands how to design buildings with straw and ideally someone with practical experience, too . Neglecting this could be costly for the building both in energy terms and longevity. Download a transcript of the interview with Mark Saich. Ben talks about reading a short story on climate change during his holiday. It blends facts from the past with a possible outcome of the future and is written by a ‘historian' in 2074. It's less than 15 pages and is well worth reading.